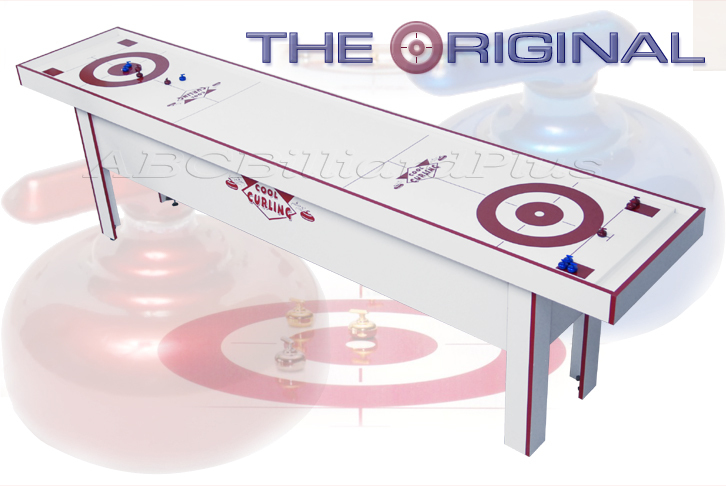 The original top-selling ten-foot table game with its clean ice cool look is sought after to compliment many game rooms and curling club lounges. With that special look and feel that matches the ambiance of the game, it is truly an experience to be had. Today’s fast-paced world provides a challenge to find the time to partake in activities we enjoy. Curling enthusiasts always make the time to indulge in their favourite diversion. Enjoyable and competitive, it makes a difference. Imagine a playing surface that reacts the same as perfect ice conditions. Only Cool Curling can provide the unmatched realism that can only be compared to the real sport, with an adjustable curl to offer any condition imaginable. 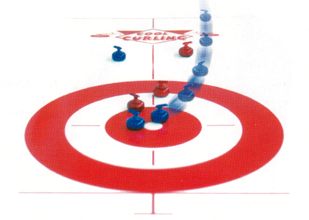 Cool Curling has developed its table-top curl to precisely match the rock movement of curling on ice. 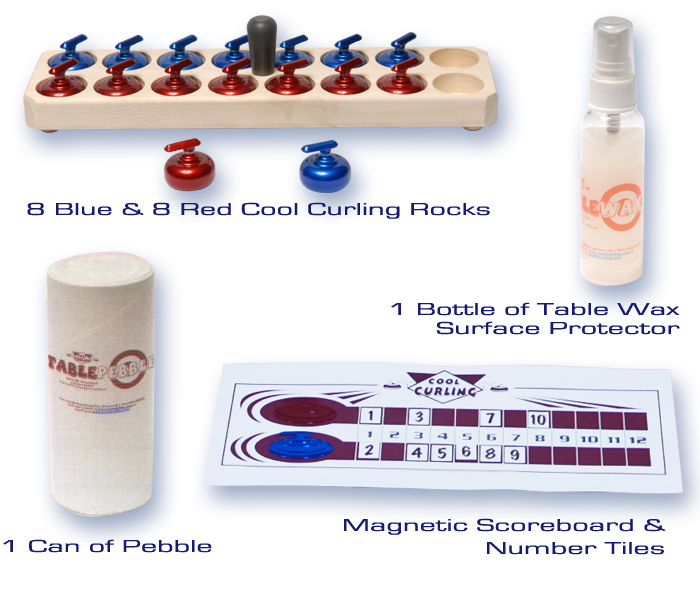 Cool Curling’s game board is coated with a durable polymer laminate surface. Our pebble consists of thousands of microscopic plastic ball bearings that cling to the surface’s electrostatic charge. The rocks glide with near zero friction, allowing for shot weight sensitivity. Each of your game’s 16 die cast steel rocks is precision machined to duplicate a curling stone’s contact surface. The rocks are then powder coated to assure a smooth, durable finish. Mounted under the game board are a series of brackets which allow players to easily adjust the amount of curl along the length of the table. 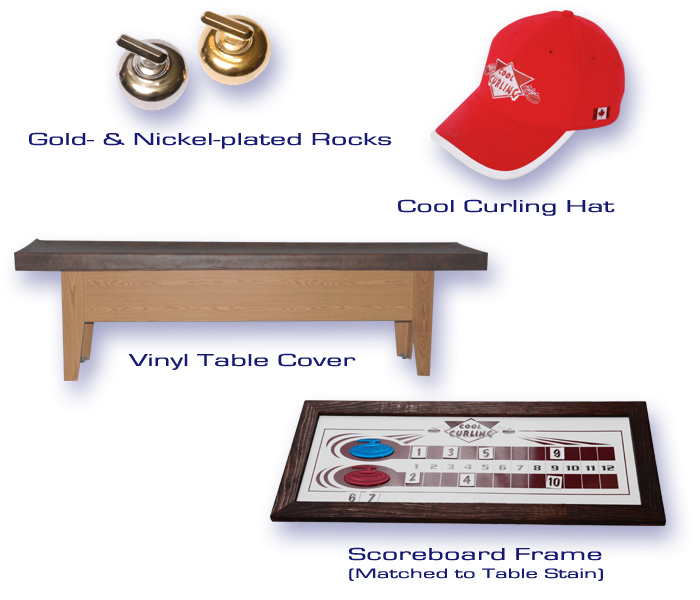 Cool Curling’s game tables, rocks and scoreboards are proudly produced by Canadian craftsmen, with materials and components sourced exclusively from local suppliers. Our commitment to quality shows in our customers’ appreciation of owning a beautifully hand-crafted piece of furniture for their home or business. Optional accessories call for prices!